Welcome to Sri Lanka, the heart of the Buddhist soul. Once known as the Pearl of the Indian Ocean, this is one of the few countries in the world that offers you pristine beaches, exotic temples, beautiful nature walks, unique heritage and panoramic landscape views. Because every wedding is intimate and inimitable, getting married in Sri Lanka gives you a chance to let your imagination go wild and to get in touch with paradise! Sri Lanka’s ancient culture, white beaches flecked with miles of coconut canopy, exotic flora and fauna and traditional hospitality makes it a memorable location to seal your wedding vows. Be it an intimate celebration for two, or a grand ceremony with twenty, Sri Lanka offers a great wedding experience and plenty of tourist delights to indulge in during your wedding period and after. 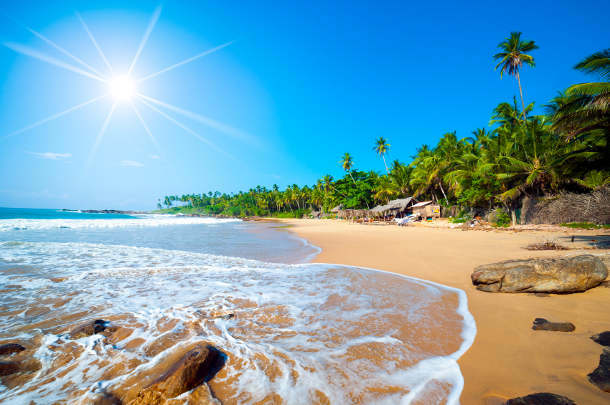 Sri Lanka is surrounded by golden sands and clear waters and this makes it a beach lovers paradise. Whether it is to celebrate romance, or to partake in some serious aquaventure ranging from Kayaking to Snorkelling, Sri Lanka’s beautiful beaches will leave you in awe. Negombo, Kalutara, Beruwala and Bentota are some of the most alluring resorts that will satisfy sun-starved visitors! You can’t afford to miss the whales at the Mirissa beach on the south coast. Go on a nature trail to help you celebrate the wild side of Sri Lanka, complete with bird watching and elephant safaris. A visit to the The Pinnawala Elephant Orphanage will melt your heart, for in this refuge for abandoned, helpless and injured elephants, you can watch babies being bottle fed and the gentle pachyderms enjoying a dip in the river. The route also comprises of boat rides and visits to ancient temples, botanical gardens and tea estates. The Sri Lankan festive calendar is marked all year through. Celebrate lights and colours with the big hearted and boisterous tea drinking natives of Sri Lanka. Watch the festive parades filled with caparisoned elephants, dancers, drummers, incense and torch bearers. If you want to capture the mesmerizing world of Sri Lanka’s glorious past on your camera, then the historical shrines, royal palaces, temples and recognized world heritage sites will definitely leave you with photographs worth sharing. As with all South East Asian countries, December-mid April is considered favourable for visits. Sri Lanka has two monsoon showers that break in different parts of the country at different times of the year. The southern and western areas have their monsoon season from May to September and the northern and eastern parts experience monsoons from October to Jan. So it its important to know when to visit which part of the country, especially if you don’t want a rain soaked wedding. The average high temperature is 41 degrees the during summer months of July and August. The average low temperature is 15 degrees, during the winter months of December and January. Greetings: It is best to wait for a Sri Lankan woman to extend her hand out first. Many native women will refrain from physical gestures with men whom they are not related to. Hugs and kisses should be avoided even as a form of greeting. It is advised to keep proximal distance with women, and to avoid touching them in public. Communication: It is ideal to address people by their title followed by surname. The people of Sri Lanka are peace loving, and generally avoid being rude and confrontational. It is best to be polite. Time Keeping: Sri Lankans have a very relaxed view of time, and you may be kept waiting at appointments. So it is advisable to bring a book along or something to keep you occupied during the wait. Etiquette: Shoes have to be removed when entering a temple/shrine and when visiting peoples homes. So you need to keep an eye open to see whether there are shoes arranged outside the door. People in Sri Lanka eat with their right hands. Taboos: It is advised not to indulge in public displays of affection of any kind. Vulgar behaviour is also not accepted. It is important to respect the images/statues of the Buddha and refrain from sitting or leaning on or touching them. Sri Lankan cuisine is influenced by various colonial influences and characterized by fragrant spices, rice and coconuts. Being an island country, fish is an important component. Rice and curry is the staple. There are various permutations and combinations of curries that will definitely leave you asking for more. Fish curry and mixed rice, deviled sweet and sour fish curry, and chilli fish curry are just some of the dishes that will keep you on a non-stop eating spree. Green leafy vegetables are close to non-existent but you can graze on a ‘’mallum’’ made of Gotukola leaves. Sri Lankan street food is called “Kottu” and comes in a variety of lip-smacking flavours. The Sri Lankan currency is called the Sri Lankan Rupee (SLR). Coins come in denominations of 1, 2, 5 and 10 rupee coins, and rupee notes come in denominations of 10, 20, 50, 100, 200, 500, 1000 and 2000. It is best to break larger notes into smaller change when shopping at small stores or markets. ATMS are common in large cities. Banks and exchange centres will change major currencies. Credit cards and debit cards are accepted mostly at higher end restaurants and hotels. Money Changers are available in all major tourist centres, but it is safer to use ATMS. It is good to note that local drivers and guides expect a tip, and it is important to discuss and agree upon a fee in advance. The general rule of thumb is to tip 10% of the amount due. Hotel porters generally accept SLR 50 and shoe keepers at the temples need to be given SLR 20. Sri Lanka is a popular choice for many couples due to the five star luxury it provides along with great value for money. Because of its exotic nature, couples often chose to wed here and then go on to explore this charming country for their honeymoon. There is an abundance of hotels to choose from that provide wedding packages either for an intimate celebration in traditional Sri Lankan style with customary dancers, drummers, and a traditional blessing. Or you can select from sweet boutique hotels and little villas for a completely custom made celebration. You can even contact some of the notable wedding planners in the country to help you achieve your dream wedding the way you want it. The average cost of a wedding in Sri Lanka is £2000-5000 GBP. The following notes are not comprehensive and are intended as a guide only. Before planning your wedding in Sri Lanka we strongly advise you to contact the Sri Lankan embassy in your home country or your country's embassy in Sri Lanka to obtain up-to-date legal requirements. Minimum marriageable age in Sri Lanka is 18. Foreign marriages must be registered with the marriage registrar's office/divisional secretariat of the area where the marriage is to take place. It is necessary for foreigners to spend at least four days in Sri Lanka before notifying the marriage registrar about the intent to wed. After that, there is a fourteen day waiting period before the date of the marriage registration. However, it is up to the discretion of the registrar to agree to the marriage on the same day under special circumstances. Once the marriage has taken place, the marriage certificate (and its English translation) should be certified by the Consular Affairs Section of the Ministry of External Affairs in Sri Lanka. Otherwise the certificate will not be recognized as valid outside Sri Lanka. Sri Lanka is divided into nine provinces – Central, Eastern, North Central, Northern, North Western, Sabragamuwa, Southern, Uva and Western. Find out more about the Provinces of Sri Lanka or browse our Sri Lankan Wedding Directory to start planning your dream wedding.